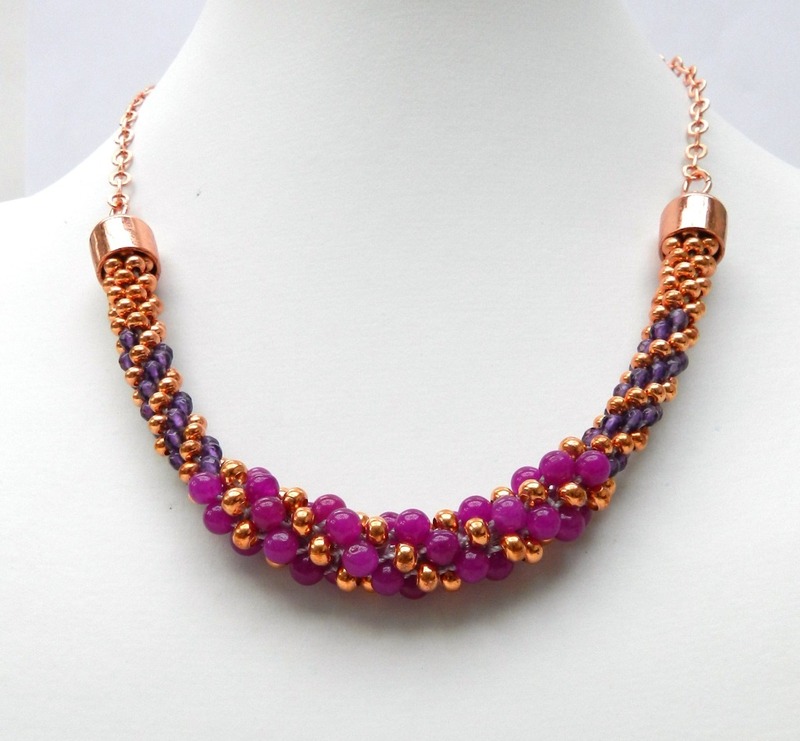 On 27.11.14 these designs were shown on Jewellery Maker as part of the relaunch of the metal seed beads. 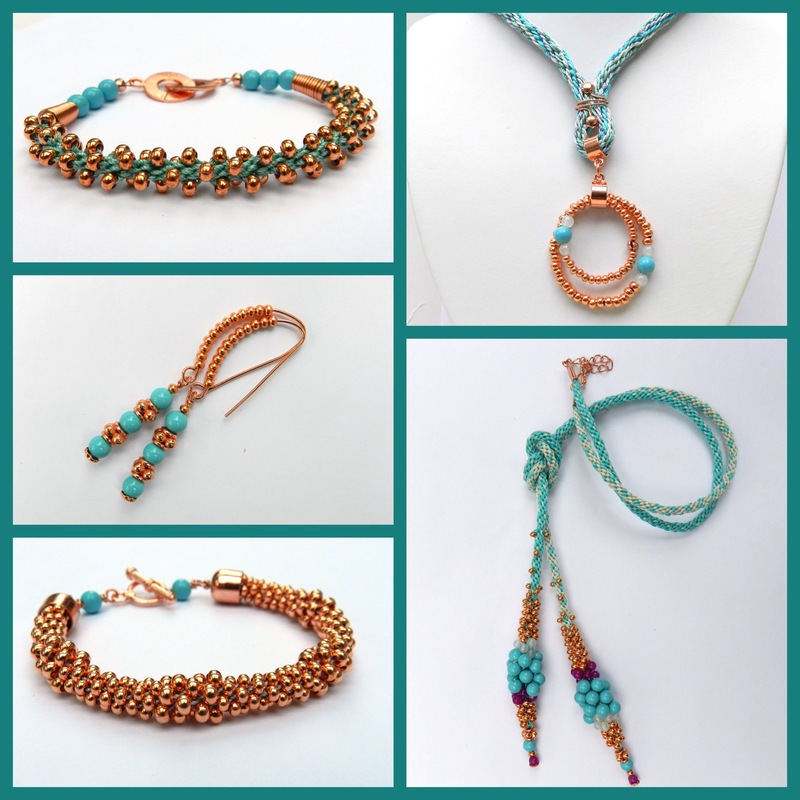 The kit for these designs included a large tube of both size 8 and size 6 metal seed beads, as well as S-Lon cord and a selection of gemstones ranging from approximately 2mm to 6mm. Findings and beading wire are also needed to make up the designs. The show can be seen by clicking here. All the designs were made using Round Braid. This bracelet is made with 8 warp Round Braid with 2 cords in each slot. To finish off the braid the ends were bound and glued and then beading wire was passed through the end of the braid (use a needle to make the hole). Crimp the wire close to the braid end, trim the shorter length of wire, thread on a cone and a few beads and then attach a clasp using a crimp. This is a 16 warp braid. Cut 8 x 1m x 4 colours. Position colour 1 on either side of the north and south dots, colour 2 on either side of the east and west dots, colour 3 half way between north and east and half way between south and west. Colour 4 in the remaining positions. Don’t forget to thread on the pendant bail before finishing the ends. Form a loop around the pendant bail and hold it in position with 2 decorative headpins. Wrap one headpin in one direction and the other in the opposite direction. Tuck the ends of the headpins into the gap between the braids on the back of the piece. Hang a pendant on the bail. Alternatively, attach a second bail to the bail on the braid and thread beading wire through the bail. Add some beads and secure with a crimp and a crimp cover. Repeat to make a smaller ring. Thread one bead onto a headpin and form a rolled loop. The loop needs to be large enough to accommodate all 8 cords. Thread all the cords through the loop and position the cords on the disk, with 2 cords in each of the slots on either side of the dots. Braid for 8 individual moves. Braid in all the beads and then continue to braid until half the required length has been reached. Don’t forget to make allowance for the knot. Repeat for the other side of the lariat, using the colours the other way round. This intricate necklace is just simple 8 warp Round Braid with beads on every cord. Use 50cm lengths of cord and follow this threading sequence. If your tension is not very tight you may need to add a core to the central part. This can be done after this section has been braided. Use a needle to sew through the end of a length of 2mm satin cord. Pass it through the centre of the braid and use the thread to pull the cord right down between the beads. Trim the other end and continue to braid to the end. Finish off the necklace with chain.